What was better than toys or snacks? Toys that made snacks! I adored the Easy Bake Oven, but I think even more than that I loved the Snoopy Sno-Cone Machine. It's also awesomely designed. Look how cute that doghouse is! So classy compared to some of the versions they have today, like the nightmade-inducing Sponge Bob Square Pants Sno-Cone Maker. Also, I think even if I lived to be 101, on my deathbed I will still be able to sing the damn jingle. "It's yum-yum fun, that is cool and keen! And its name is the Snoopy Sno-Cone Machine!" My childhood best friend had one and I always wanted one! Finally a few years ago I bought a vintage model on Ebay. The blades are rusty and it would break if used. It's more of a conversation piece! As a kid I was obsessed with all things Peanuts, so of course I had the Snoopy snow-cone maker. It was serious work grinding up those ice cubes... and when you were done you had just a tiny bit of ice! I think I only used it once or twice. 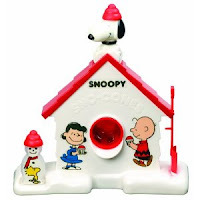 I also had the Snoopy battery-operated toothbrush, which didn't work well either.